Your own domain name allows people to find and remember your website. Once the name is registered, it is yours! No one else may use it. It's a good idea to register some very best domains and then sell them to somebody else later making profits. You may know some domains sold multi-million dollars. That's a great investment!! The original gTLDs -- .com, .net and .org -- are still number one. On average, 2.5 million new registrations per quarter. These names have worldwide recognition and are still in demand. Hurry up! The top-level domains are being run out very fast. 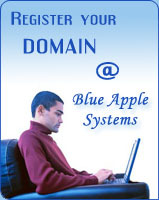 Get started today and reserve your own domain names before someone else does it!